We got up at 7:30 am. Mike and Mary came over to our apartment about 9:00. We went with them to Sieci, which was on the other side of the mountain from Fiesole for breakfast. We had driven into Sieci when we arrived from Ravenna. The eatery where Mike and Mary usually ate breakfast was closed but we found another restaurant in a hotel where we had coffee and pastries on a covered terrace/porch. Our plan was to visit the dentist that owner of our villa had told us around. We finally found the building but none of the offices were open. We waited around for a while and decided to go back home. Sieci is a nice little town on the banks of the Arno River, the river which run through Florence. The town itself is only one or two streets wide. The main street, which is the main road for the area is not vary wide but affords parking spaces on both side in front of the local stores. The dentist’s office, which we will visit twice more, was towards the side of a beautiful little town park. There were many trees in the park and nice benches. We sat there waiting for the dentist office to open. Across the street was a church with a very high bell tower. I went over to explore it and take photos. I couldn’t find out much about the church, but since have located a webpage for it. 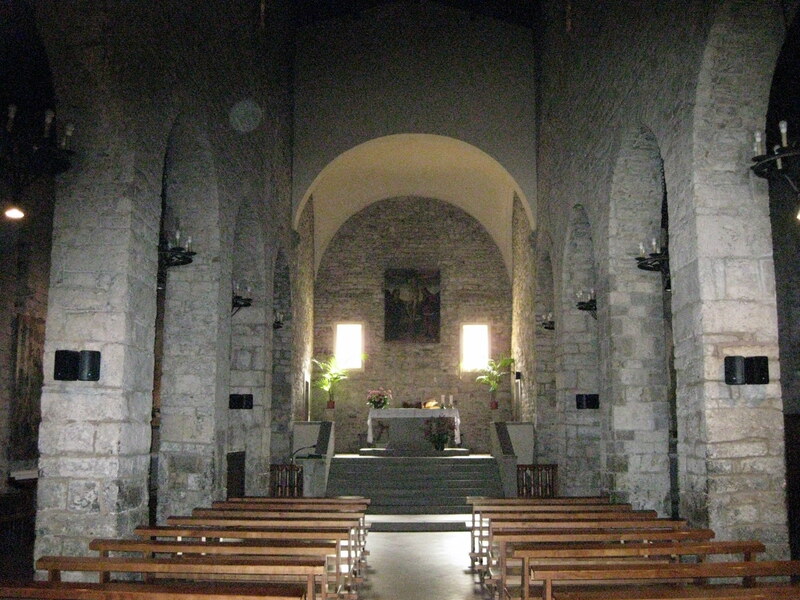 The name of the church is S. Giovanni Battista a Remole (St. John the Baptist of Romulus). There are documents claiming the church goes back to 935. During the 13th century, the church was enlarged which transformed the building to three aisles which is the way it is now. The interior was decorated with various works of art among which the Madonna and child that goes back to this period. In 1740 a disastrous flood caused considerable damage to the church. During the nineteenth century Sieci grew larger, thanks to the brick industry which gave employment to many families. The population grew nearly four times going from 625 inhabitants in 1825 to 2100 of the 20's of 1900. We enjoyed our stay there. We came back to the villa, and did a little washing. 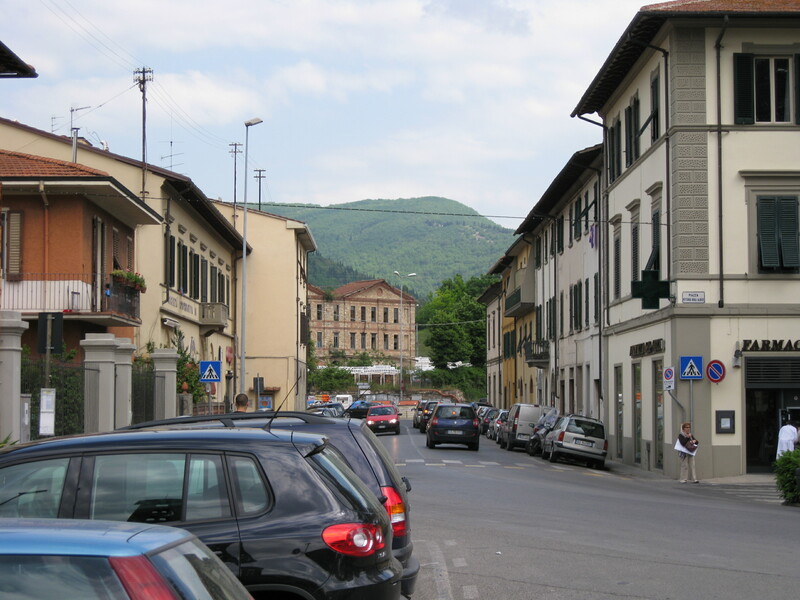 Mike and Mary wanted to stay home so we went back to Fiesole to catch the bus for Florence. We had a hard time finding a parking place. We got on a little narrow road from one of the parking lots that was filled. The further we went on this road the narrower the road became. It was one way – we hoped we did no t meet an oncoming car as there was no place to pull over. It was pretty scary. We had no idea where we were but our GPS kept giving directions. We finally got back to Fiesole and found a parking place. We caught the bus to Florence. We went to Santa Maria Novella. 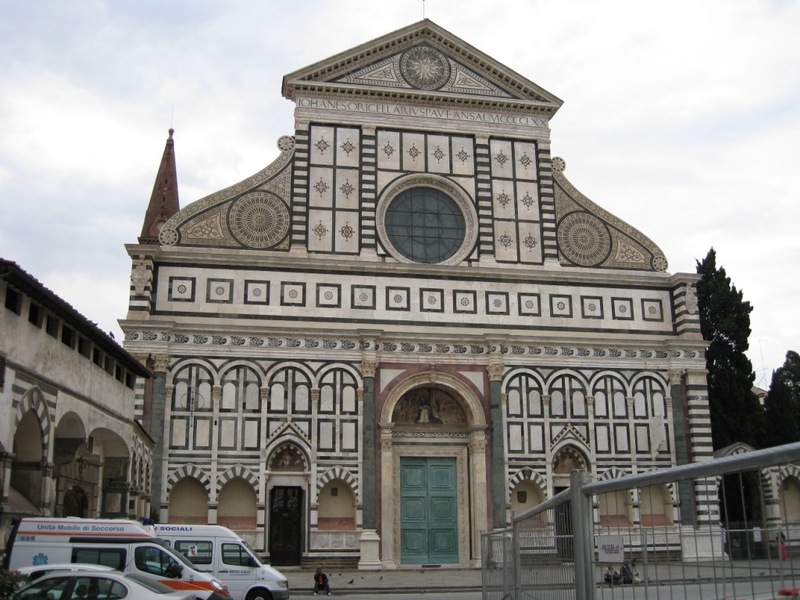 The Gothic Church of Santa Maria Novella contains some of the most important works of art in Florence. The present church was built in 1279, finished in 1357 by the Dominicans. The façade was started in 1350 and finished in 1470. The architect, Leone Battista Alberti, framed the lower portion with side pilasters and four columns. The large door is enclosed in an arch. Separating the bottom of the façade from the top is a wide horizontal strip decorated with square inlay. Above this strip is a large circular window which is flanked on either side by two circular designs. The façade is topped by a triangular pediment. It was interesting to look at the façade from the side and see how it had been added to the former brick façade. The interior was magnificent. It was built as a three aisle basilica with trancept and five square chapels. It is said to be one of the most important examples of a Late Gothic interior in Europe. The arcades are very wide. 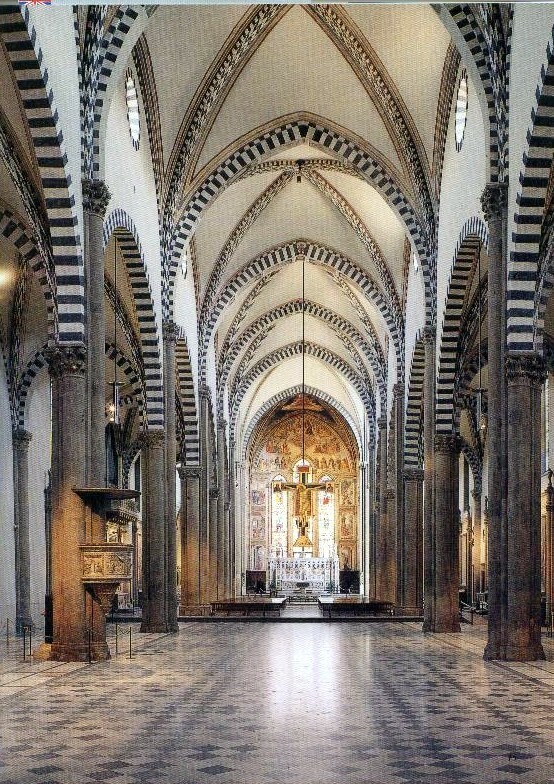 All of the columns are dark stone while all of the arches display a border of alternating dark and light stone- even the arches in the vaulted ceiling. The nave piers are spaced closer at the east end to create the illusion of an exceptional long church. We saw many of the paintings that we had seen on the Teaching Company Lectures on Renaissance Art, especially Masaccio’s Trinity and Giotto’s crucifix. Masaccio’s Trinity is one of the first works in which the painter devoted his attention to the laws of linear perspective which had been recently developed by Brunelleschi. The impression of a space extending back into the wall is created through the depiction of the coffered arch ceiling. God the Father dominates the crucifix with the Christ figure in the center. The Holy Spirit is as a dove over the head of Jesus and beneath of chin of God the Father. Mary and Joseph are shown kneeling at the side of the cross. The three dimensional effect continues with two patrons kneeling on a step below like a room in front. The bottom of the fresco, also in perspective, is a tomb with a skeleton on top. There is the following inscription of the tomb:” I was what you are, you will be what I am”. 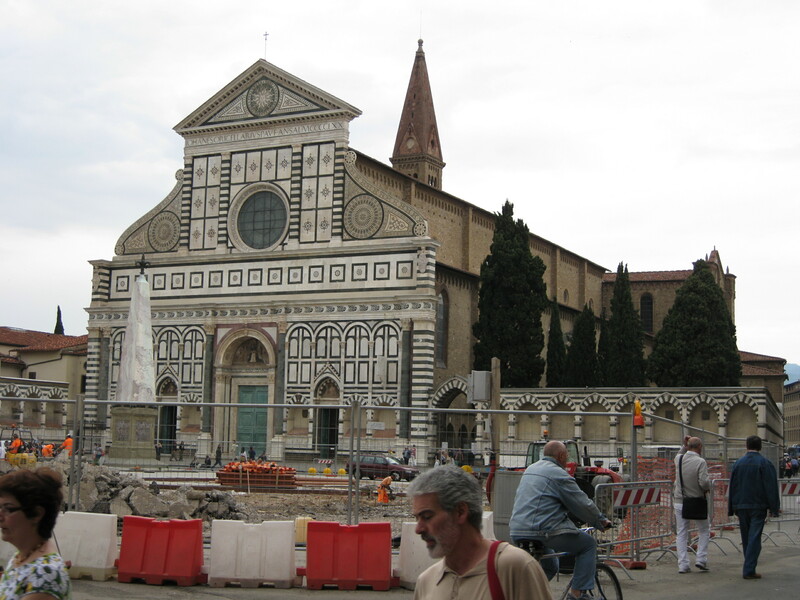 There are four famous chapels in Santa Maria Novella. 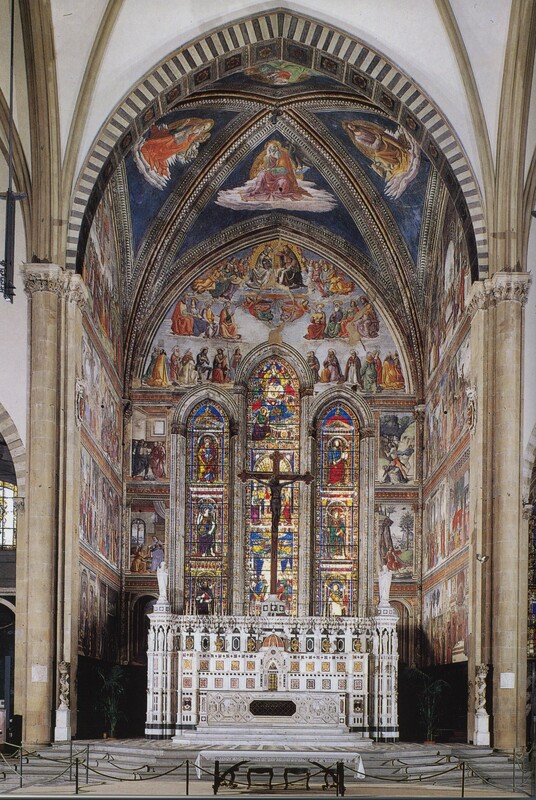 The Tornabuoni Chapel – in 1485 Domenico Ghirlandaio was commissioned by banker Giovanni Torabuoni to paint this chapel. The walls were frescoed with the events from the lives of Mary and St. John. We had studied these paintings during the Teaching Company lecture. Among the most noted panels were the Birth of the Virgin and the Birth of John the Baptist. Another chapel with beautiful frescos is the Filippo Strozzi Chapel. It was donated by banker Filippo Strozzi who commissioned Filippino Lippi to fresco the walls with episodes from the lives of St. Philip and John the Baptist. A third chapel was donated by Tommaso Strozzi who commissioned the brothers, Nardo and Andrea di Cione. 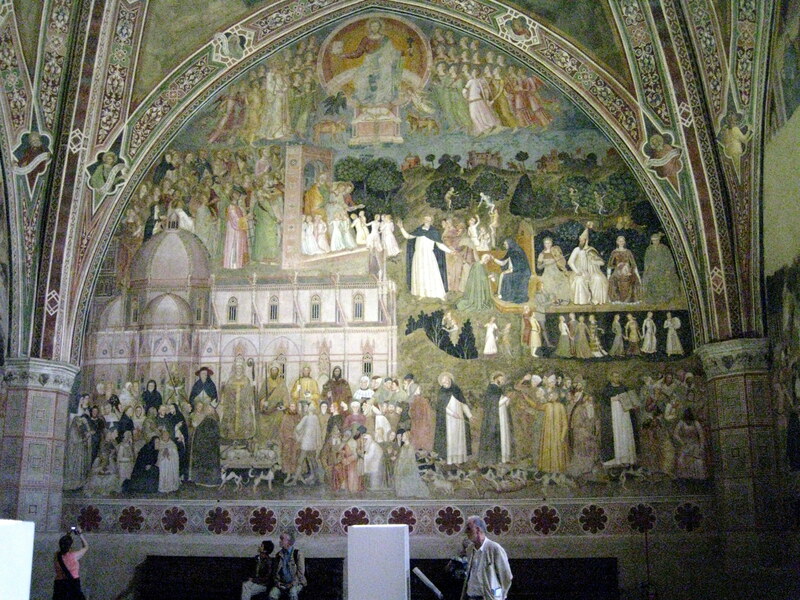 The main wall depicts the Last Judgment while the two side walls are scenes from Dante’s Divine Comedy. The fourth chapel, the Spanish Chapel, is entered from the Cloister. The Cloister itself is very interesting with frescos of Noah and the Flood by Uccello. Unfortunately much of these paintings were destroyed by the 1966 flood. The Spanish Chapel had been a Dominican chapter-house by around the mid 14th century. It became known as the Spanish Chapel when it was dedicated to the use of the Spanish community in 1556 in honor of the Duchess Eleonora of Toledo. The entire chapel is frescoed with sections based on a theological theme which reflects the philosophy of the Dominican order and describes the path of humans to redemption and salvation. It was a very moving experience, and we spent a long time absorbing these magnificent works. There wasn’t anyone there to tell us not to take photos so I took a picture of each panel. It was 4:30 when we left Santa Maria Novella, and too late to go somewhere else, so we walked back to the Duomo. The bookstore was open so we bought a book on the Duomo. We walked towards to the bus, but found a nice bar where we had a drink before heading back to Fiesole. At 5:15, we caught the bus back to Fiesole. It was an experience…rush hour…talk about sardines!! We found that we had had a phone call from Mike about the dentist, but it was too late to go. Mike and Mary showed up in Fiesole, and we went to the same restaurant as last night. The waitress didn’t understand English. Mike and Mary finished dinner before we got our appetizer. My wife had ordered soup but when it came it was clams. She sent it back and got some minestrone soup and gnocchi. I had liver pate on toast, then mushroom pasta and later breaded veal and fresh fried potatoes. It was a good meal, but not a fine dining experience. We went back to our apartment in Monteloro and spent the rest of the evening reading and writing. Being in the beautiful Santa Maria Novella was an experience that we will never forget. This is a MUST stop for anyone visiting Florence, of course, we are going to say that about every church that we will visit!! !